Your property has a slope. The uneven ground makes it challenging to cut the grass when you’re on foot. That’s why you need one of the best riding lawn mowers for hills. But we won’t lie to you. There are limits to what is safe to do with a lawnmower or a lawn tractor. For example, a zero turn radius mower is best for slopes of 10° or less. And a lawn tractor shouldn’t be used on a slope over 15°. The reason is that either kind of vehicle is likely to flip or tip. Also, they may simply not have enough power to handle the climb. So what’s the solution? One answer is to purchase a commercial lawn tractor designed to mow hills. And another method is to purchase a rough cut mower. This is basically a trailer with blades that you can hitch to another mower or tractor. Then you can drive along the top of the hill where the ground is flat and allow the rough-cut mower to do the work for you on the slope below. How do you know if your slope is too steep for a riding mower? You’ll need to do some measuring and a little math. Get two stakes and plant one at the top of the steepest section of the hill and another at the bottom. Tie a string between them. Now slide the string up the bottom pole until it’s level. Now measure how high off the ground the string is on the bottom stake. Then find out how far apart the stakes are. Divide the first number by the second and you’ll discover the slope. When you mow a slope on a riding lawnmower, you’ll drive up and down, not across as if you were pushing a mower. You might not be able to use attachments like a rear bagger if the hill is too steep. That’s because it makes the back of the mower too heavy and likely to flip. For extra security, select a mower that has the US Consumer Product Safety Commission ANSI B7.1 Certification for traction and stability. We researched to find the most powerful riding lawn mowers for hills. We hope these reviews help you find the best fit for your needs. Husqvarna makes several models of riding mowers for tackling uneven terrain. This one features a 24 hp Briggs & Stratton V-Twin engine that makes it easy to mow up to 15° slopes. Not only does it have a hydrostatic pedal transmission, but it also has cruise control and electric blade engagement. A simple turn of the key starts the motor. You can adjust the cutting height on the fender, then mow both forward and in reverse. The air induction system lists the grass to make sure you get a clean cut every time. Moreover, you can equip the tractor with a mulch kit or other towable accessories. Snapper’s 22 hp tractor mower also has a Briggs & Stratton V-Twin engine. The hydrostatic transmission ensures smooth control. But the main highlight is the 14-inch turning radius. That makes it very easy to maneuver considering its size and power. There are seven cutting heights between 1 ½ and 4 inches. Additionally, the mower comes with anti-scalp wheels and electric blade engagement. The John Deere E140 lawn tractor is compliant with strict emissions standards imposed by California state law. It has a 22 hp V-Twin gas engine with speeds up to 5.5 mph. There is also electric blade engagement plus side-by-side foot control pedals for the hydrostatic transmission. Husqvarna’s 42-inch riding mower has a 19 hp engine and a pedal-operated hydrostatic transmission. That way you can keep both hands on the steering wheel. The price of this mower is more accessible because it has a Chinese-made Loncin motor. But it’s compatible with both a mulch kit and Husqvarna’s towable attachments. The Husqvarna LTH1738 has a 17 HP Loncin engine, which is an economical motor made in China. The 38-inch cutting deck makes this mower easier to store in a garage or shed. Even though it’s compact, it’s still compatible with many accessories. 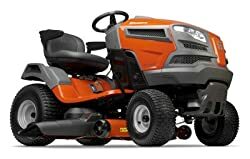 It has Husqvarna’s air induction mowing technology that lifts the grass for precision cutting. It also has a pedal-operated hydrostatic transmission so that you can keep both hands on the ergonomic steering wheel. Troy-Bilt’s Neighborhood Riding Mower may be one of the best-selling models of all time. It’s very compact yet powerful enough bumpy terrain. It’s recommended for relatively flat yards and it has a standard 18-inch turning radius. In other words, this one may be attractive due to its low cost, but it’s not our top pick for mowing hills. 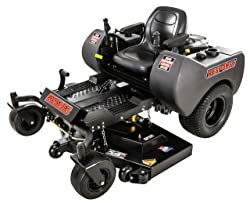 Poulan Pro’s 46-inch riding lawn mower can handle hilly terrain with its 17.5 hp Briggs & Stratton engine. This company is a subdivision of Husqvarna, so it’s no surprise that the mower has the same air induction cutting technology. The mower has six speeds and six cutting heights with a spring -assisted deck lift. The anti-scalp deck wheels help you avoid creating bald spots in your lawn. And the 16-inch turning radius is impressive for a mower of this size. Cub Cadet’s 46-inch riding mower comes with a three-year unlimited hours warranty on the Kohler engine and a five-year warranty on the chassis and front axle. It has a hydrostatic transmission controlled by a pedal and a spring -assisted deck lift. You can set it to 12 different cutting heights between one and 4 inches. The 5.5 mile-per-hour top speed beats pushing a lawnmower yourself. And the neutral start, brake pedal lock, and reverse mowing technology helps you stay safe. There also LED headlights and a digital meter to remind you when to service the mower. MTD’s 42-inch lawn tractor has a Troy-Bilt engine and a seven-speed transmission. It comes with a two-year limited warranty, but can’t be shipped to California. This is another less expensive option if you need a lawn tractor for light duty. When you have a lot of property to mow with slopes not exceeding 10°, you might prefer a zero turn radius mower. ZTRs are highly maneuverable and very fast. This one goes up to 8.5 mph while mowing. This ZTR from Toro has a 54-inch cutting deck with three blades powered by a 24.5 hp commercial engine. It keeps the ride from feeling too jerky with a specially-designed suspension system and anti-vibration mat. Plus, it gives you precision control with 13 cutting positions between 1.5 and 4.5 inches in height. Finally, it comes with a hitch for pulling attachments. Swisher sells their 54-inch Response ZTR with three gator mulching blades on board. In fact, it arrives fully assembled. With a 24 hp Briggs & Stratton engine, it speeds up to 8 miles an hour in forward and reverse. Moreover, the Ogura clutch and Hydro Gear 2800 transmission gives you smooth control over all that power. With an eight-gallon fuel tank, you can work for hours without having to stop. Hitch the Swisher rough cut mower to a lawn tractor and make quick work of big jobs. It comes with its own 14.5 hp Kawasaki commercial engine with electric start. Furthermore, it can handle up to 3-inch thick stems with its stump jumper and breakaway swinging blades. The only thing you’ll need to do is add a standard 12 V lawn and garden battery. Snapper makes this 61-inch ZTR with a built-in cargo bed. It features speeds up to 9 mph with the 24 hp Kawasaki engine. And the 10-gauge steel deck is so sturdy it comes with a lifetime warranty. You might be curious whether an electric battery-powered riding mower is powerful enough to handle slopes. The Ryobi RY48111 is. It handles 15-degree slopes without a hiccup. One owner commented that they mowed a steeper hill by simply driving down it instead of up. The 100AH lead acid batteries charge through a standard 120 V outlet and last for up to 2.5 hours of runtime or 2.5 acres of mowing. The batteries endure this long simply because the mower has three brushless motors for top performance. The advantage of a battery-powered mower is that you’ll never have to deal with gas, fumes, oil changes, or excess noise. And this one is compact enough that you can store it in your garage. In conclusion, other benefits include the following. First, there are 12 positions for cutting heights between 1.5 and 4.5 inches. Second, the mower has cruise control and a USB charger for your portable device. And third, the headlights and under 70dB noise level let you work early in the morning if needed. The top riding lawn mowers for hills have the power you need to tackle slopes. Select a zero turn radius mower for superior maneuverability and speed. Or choose a lawn tractor for steeper climbs. In any case, while most riding lawn mowers are gas-powered, electric models are also a viable option.